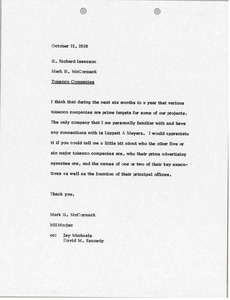 McCormack writes concerning the attached letter about Dunhill tobacco. He has no problem so long as they observe their territorial agreements with Imperial tobacco in Canada and Sousa Cruz in Brazil. 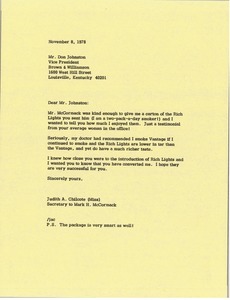 Commenting on Rich Lights cigarettes given her by McCormack, Chilcote notes her enjoyment, the richer tasts, and the lower tar content than Vantage. She hopes the cigarette sees success on its launch. McCormack believes that in the next six months to a year, various tobacco companies are prime targets for some of their projects. 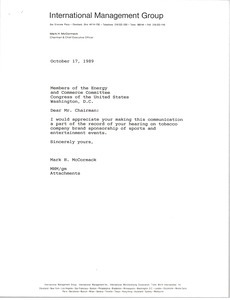 Memorandum from Mark H. McCormack to Arthur J. Lafave Jr.
McCormack forwards a letter from Philip Morris company concerning Congress' attempt to ban tobacco company sponsorship of sports and entertainment events. 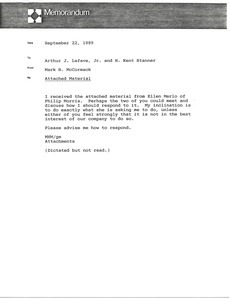 They send a draft of a written statement McCormack should submit for the record when public hearings are announced by the bills' sponsors. McCormack introduces himself as CEO of IMG, a company "dedicated to forging beneficial partnerships between the sports and business communities." Discusses and defends the sponsorship activities of the tobacco industry. 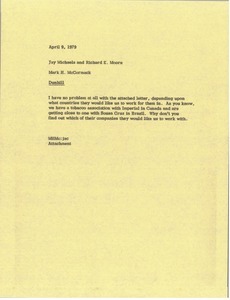 Letter from Mark H. McCormack to Members of the Energy and Commerce committee. 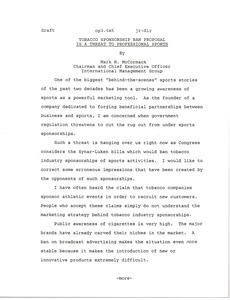 McCormack asks that the attached be made part of the record at the committee's hearing on tobacco company brand sponsorship of sports and entertainment events. 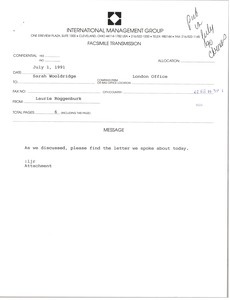 Attached is a written testimony of Mark McCormack, another paper by McCormack oppsing the tobacco sponsorship ban, and relevant correspondence about this committee meeting and earlier drafts of the attached documents. McCormack introduces himself as CEO of IMG, a company "dedicated to forging beneficial partnerships between business and sports." He notes his concern when government regulation threatens to cut the rug out from under sports sponsorships and specifies the Synar-Luken bills in particular, which would ban tobacco industry sponsorships of sports activities. 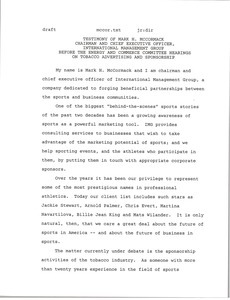 McCormack sends his testimony on sponsorship activities of the tobacco industry and another document explaining his stance on the Waxman Bill which would ban tobacco brand name sponsorships of sports activities. 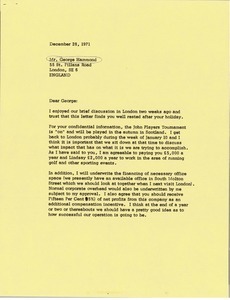 He also sends a memorandum from Alan Miller on this topic. 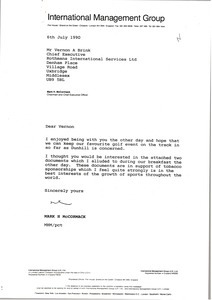 McCormack sends a letter he wrote to Henry A. Waxman including a statement to be included in the hearing on tobacco company brand sponsorship of entertainment and sport activities.